The singer-songwriter from Merseyside, who released his second album Don't Forget Who You Are, last year, is set to embark on a tour. He is supporting Arctic Monkeys at their big outdoor shows this year and touring the UK and Ireland this month. Miles admitted that there were a couple of gigs on the recent European tour that "weren't as busy". He said: "A lot of the shows were sold out, but there were one or two that weren't busy for whatever reason. "I used to get upset about it, but now I buzz off it. I try to embrace it and control the show differently. "I don't want to go on stage and behave the same way as if it was a packed show, it looks like you're forcing it and if I was in the crowd watching, I'd cringe. "When everyone's going mad in the crowd, I go mad too, but if they're reserved, that changes me too. There's no point shouting 'Hands in the air everybody' to 20 people standing at the bar." 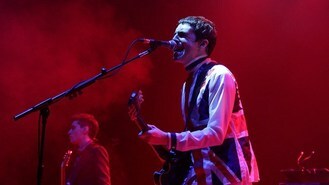 For more information go to www.mileskane.co.uk.